December 29, 2011 by Cary H.
At the end of every holiday season, I, along with millions of others exasperated celebrators begin to take stock of all the spending. Where did you let loose your holiday funds this year? If recent trends are any indication, most people did their shopping online. Though brick-and-mortar stores saw many spenders as well, it seems likely that online shopping will continue to be a very viable (and preferred) choice for most shoppers. Though our online purchasing power has ramped up over the last few years, shopping meccas remain in many major cities, such as New York, Chicago, and San Francisco. Philadelphia’s own retail star has dimmed some over the past, but its Center City neighborhood is undergoing something of a shopping revival. However, among the chains and independent stores, the area lays claim to only one large free-standing department store: Macy’s. It wasn’t that long ago, though, that Center City had four major, long-running department stores all within a few city blocks: Wanamaker’s, Strawbridge and Clothier, Lit Brothers, and Gimbels. These stores brought the spending community together to one location that was easy to navigate and convenient for drivers as well as public transportation riders. They also helped set retail trends that continue to this day. Below is a bit of history about each. 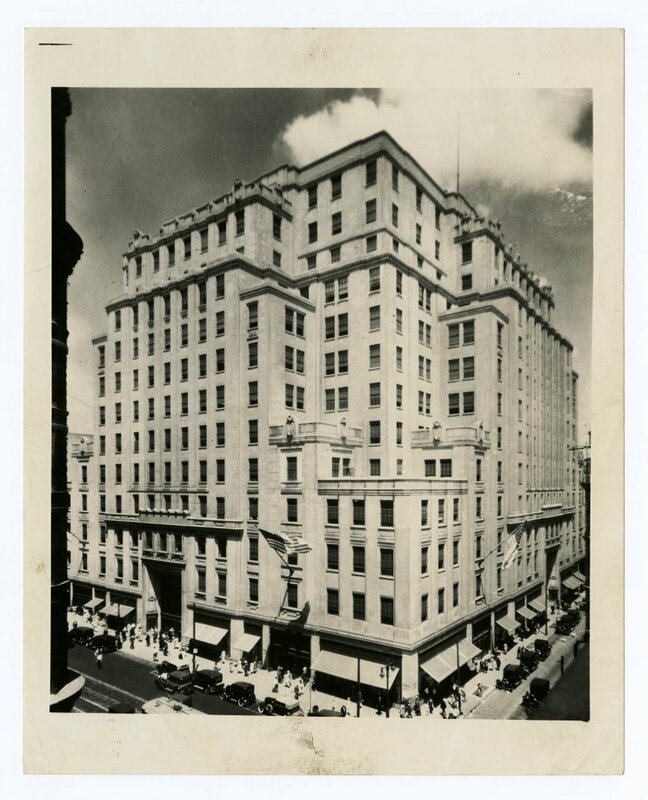 HSP has a number resources and images (more can be found in our Digital Library) concerning the histories of Philadelphia’s great retail stores. Many Philadelphians carry with them memories of shopping at these places. Feel free to share yours in the comments section below. John Wanamaker (1838-1922) was a well-known merchant, entrepreneur, and lifelong resident of Philadelphia, Pennsylvania. He opened his first Philadelphia clothing store, Oak Hall, with partner Nathan Brown in 1861, and founded John Wanamaker and Co. several years later in 1869. In 1876, they opened “A New Kind of Store” known as the Grand Depot at 13th and Market Streets. This store later became the flagship store, which eventually branched out into central and southeastern Pennsylvania. Satellite stores were also established in New Jersey, Delaware, and New York City. Wanamaker was at the forefront in many areas in retailing including merchandising, employee relations and advertising. In the mid-1990s, Hecht’s took over all of Wanamaker’s branches, including the Philadelphia flagship store, which, after being closed for several years, became Macy’s in 2006. In 1955, flagship store employee Frederick Yost, also a visual merchandiser and advertiser created the Christmas Light Show that included lighted character timed to an audio recording. The display has been renovated and updated throughout the years and continues to be a highlight (and tradition) for many of Macy’s holiday shoppers. 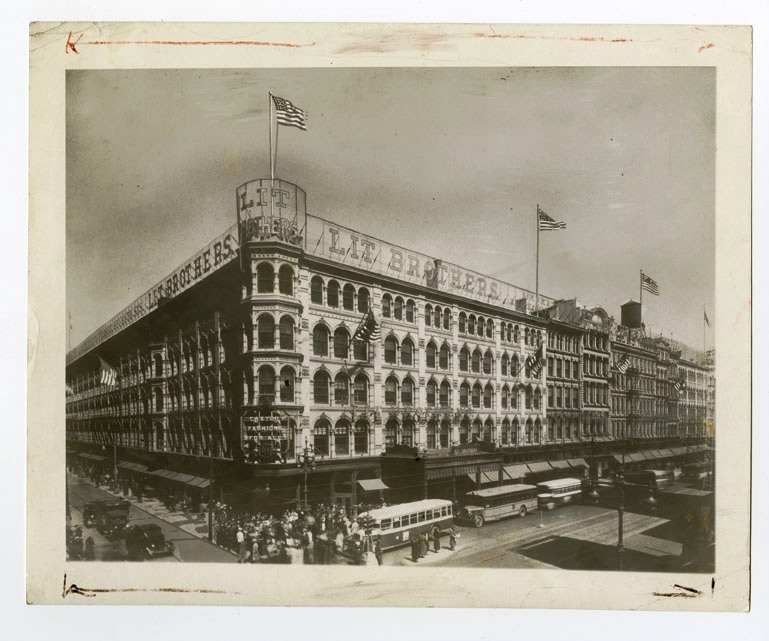 This major department store began as a small dry goods store founded by Justus C. Strawbridge (born 1838), an enterprising young Quaker from Mount Holly, New Jersey, in 1861 in a rented three-story building at 8th and Market streets in Philadelphia. Strawbridge developed a close friendship with Isaac H. Clothier (born 1837), one of his cloth dealers from Philadelphia, and the two decided to partner. Strawbridge and Clothier opened July 1, 1868, and a new five-story store replaced the old building. For a time, this store served as the only place in Philadelphia where one could purchase both domestic and European goods under one roof. In 1930, despite the economic depression, the company expanded their store to a satellite branch in Ardmore, Pennsylvania—it was the first time a local department store branched out to the suburbs. In the 1960s, Strawbridge and Clothier further diversified by opening a discount chain of stores under the name “Clover.” Strawbridge and Clothier remained a family-run business until it was sold to the May Department Store Company in 1996. The Philadelphia store officially closed in May 2006 after being in operation for 138 years. 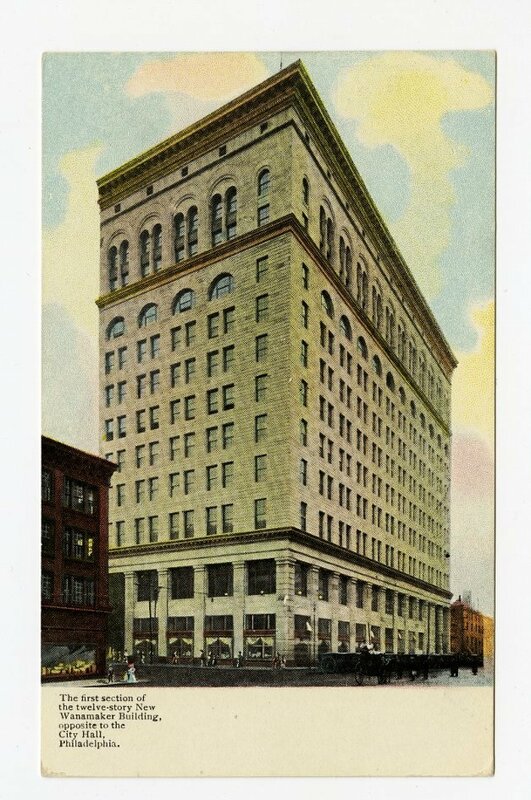 In 1893, Samuel and Jacob Lit opened their first department store in Philadelphia. In an environment that already included plenty of competition, the Lit brothers set their store apart by offering lower prices on similar goods. It developed a popular millinery department with the slogan “Hats Trimmed Free of Charge.” In the early 1900s the store was rebuilt into a flagship site that took up an entire city block. The store was bought in the 1920s by the investment and trading house Bankers Securities Corporation, run by Philadelphia financier and philanthropist Albert M. Greenfield. Lit Brothers became known for its “Enchanted Colonial Village,” a Christmas display like those developed by other department stores. This tradition started in the 1960s, and the village was designed by Philadelphians Thomas Comerford and was built by Christian Hofmann, a German toy creator. This was the first of the four stores to succumb to financial troubles — it filed for bankruptcy in the 1970s. The Lit Brothers flagship store closed in 1977. Adam Gimbel (1815-1896), a Bavarian by birth who immigrated to the United States in 1840, opened up his first retail store in Vincennes, Indiana in 1842. At a time when bartering and negotiating sales was still common, Gimbel introduced fixed pricing in his store; that is, everything had a set price that was non-negotiable. This “one profit system” became was one of the hallmarks of modern retailing. Gimbel was also one of the first retailers to accept returns and give refunds. With the introduction of railways throughout the Midwest and the changing economic landscape of the mid late 1800s, some of Gimbels old stores were closed, while other branches were created. Gimbels opened in Philadelphia in 1894 at 9th and Market streets. 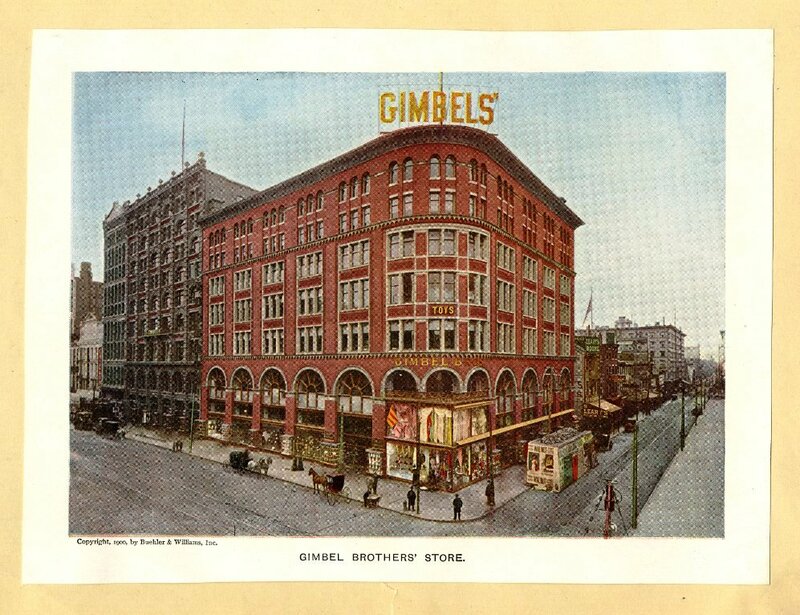 At the time, Gimbels was controlled by several of Adam Gimbel’s sons and grandsons, and the family continued the tradition of offering reliable goods and services at fixed prices. In 1920, Gimbels, prompted especially by Ellis Gimbel, began sponsoring a Thanksgiving Day parade, which is considered the nation’s oldest. Gimbels was associated with the annual celebration for over 60 years until the store closed in the mid-1980s. This entry was posted in Archives and tagged Gimbels, Lit Brothers, Philadelphia department stores, Philadelphia retail history, Strawbridge and Clothier, Wanamaker's. Bookmark the permalink. A student of mine received an old Bailey Banks & Biddle “Lucky Chip”, and was wondering about it: when was it made, and what was the purpose of it? It is a large metal coin. We have been unable to find any information on the Internet thus far. Does anyone know anything about this?